2015 will come and go without an interlocking CIS football schedule. Two weeks, Ontario University Athletics told Andrew Bucholtz at Yahoo's Eh Game blog that they are not interested in interlock for 2015. With that declaration, the OUA likely broke ground on the grave for the Northern 8 idea. Let's get this clear from the jump: initially, I was not a fan of the interlock idea because of the many questions that arose from the proposal. But when you dig into the idea, when you look at the Northern 8 proposal as I've been afforded the opportunity to do, those questions have answers. At the very least, a nation-wide schedule is worth a shot because it is absolutely better than what we have right now (which is essentially nothing). We need to really look at this idea though, because there are some micro and macro issues in play here. Frankly, those reasons are short-sighted, although I do understand them to a degree. I know that financials are tight around the OUA. This era is a nightmare on university wallets too, with the dollar divide only becoming larger. For example: Carleton received a $500,000 donation at the Panda Bowl, a figure that tops Waterloo's budget of $400,000. We're all kind of stumbling around in the dark here, wondering when (or if) the well-funded programs will soon dominate the league. The threat exists, even if it has manifested into any championship teams yet. Any across-the-board cost increase likely illicit firm "nopes" from OUA members. I don't know if that's true, I'm not in those boardrooms. The interlock proposal would ask the competing schools to secure sponsorship to cover those costs. Given the OUA's rejection, we have to assume it was hard to come by those sponsor bucks. This project isn't pitched as a one-year deal, though. There's an actual plan for the years beyond 2015. To wave the proposal off because of travel costs and unwilling sponsors assumes this will fail to grab any attention if it hits the airwaves. And, apparently, there is an network appetite for this content. So, saying "we aren't doing this because of travel costs" seems more like the OUA doesn't want to take a financial risk. If this is successful, meaning the games are appealing, competitive and people actually watch it, won't the dollars follow? And the issue of interlock games ... yeah. I get it. On its face, the interlock proposal means some teams have a tougher schedule because they face other elite programs. If an OUA team goes undefeated in their conference but splits their interlock games, how will that affect their record? Those bridges have been crossed before. I'm not going to provide the answer for you because I don't have the skills to do that, but I'm damn sure we can find someone at one of the 27 different CIS football to figure it out. With things like Simple Rating System and Ratings Percentage Index, we can attempt to find a solution rather than casting it aside because we don't have one right now. The OUA's reasons for turning down the proposal for 2015 aren't that complex. The financial issue is understood, but part of the long-term goals of interlock is to create more revenue. Schools need to invest for that to happen. Conference standings could easily be figured out too. Those weak reasons lead me to believe there's a larger issue at play. The OUA has its own house to clean up. The conference got punted from Sportsnet for low viewership numbers and (I'm sorry for bringing this saying up again) it's a league of haves and have-nots. You have to figure the OUA knows this. They instituted the Guelph Gryphon rule, meaning teams will have restrictions on uniform variations. That rule is a laughable attempt at evening the playing field, but the message is clear: OUA football schools want things, regardless of their competitive relevance, to be "fair." In the interest of time, we can agree the OUA isn't competitive and we know who will be making Yates runs every year. I'm sure that this is a concern for the conference and they want to create a balance, but it's been an issue for years. The concept of spending limits has even been thrown around by Peter Baxter, the OUA football convenor. While the OUA wants to sort out its problems, CIS football is being passed over as a sports property. It is unclear if the OUA will ever reach competitive balance, and even if they do, will anyone still be paying attention? On Friday, February 6, the OUA released the non-contenders for each football team. They did this via Instagram and it was a great idea. That medium is hugely popular with today's undergraduate population and the use of Instagram to release news is a welcome sight. But this little video meant interlock was dead for 2015. CanadaWest issued a press release to say they endorse the idea; the OUA dropped an afternoon Instagram to announce their intentions. I don't know if the interlock crew were notified ahead of time, but from an optics perspective, this doesn't look great. The two sides are clearly at odds, and if you're a potential sponsor, do you want to associate yourself with this? The issues go deeper than this too. Interlock talks are at a standstill -- right now and for the foreseeable future -- because conversations simply aren't happening. A "CIS football task force" has been started to essentially deal with the Northern 8 proposal. It's headed up by Peter Baxter, and I tried to talk to him about it. He did not respond to an email I sent. This is the big one. With Pierre Lafontaine's buy-out (which we still haven't received an actual reason for), the CIS is now without a CEO and their Director of Operations & Development. Both of those seem kind of important in moving an organization that has floated under the radar into the mainstream. Yet, they don't have them and here we are ... the same as it ever was. I have followed CIS sport for four years now and it is in a worse spot than when I began my coverage. 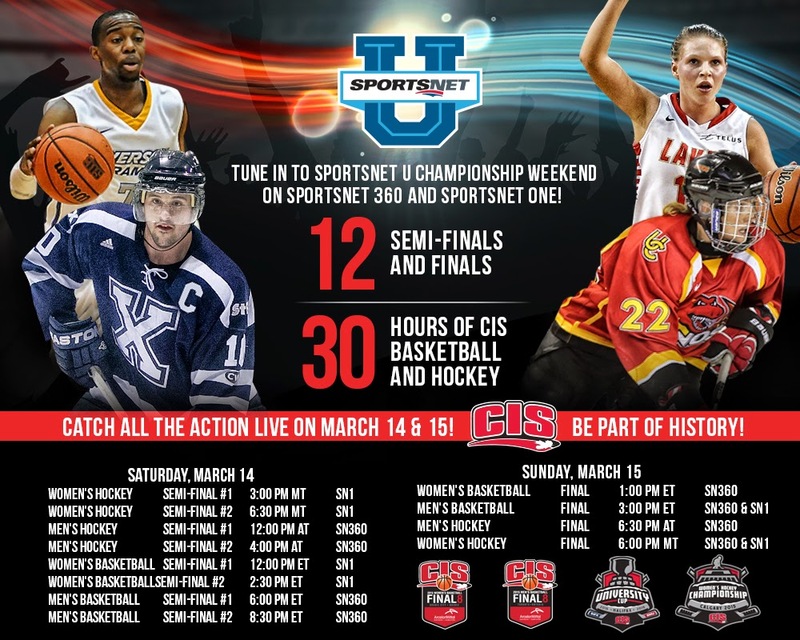 In the era where live sports are exploding in value, the CIS has a "Super Championship Weekend" where their basketball and hockey championships are broadcast over one weekend. 30 hours on content over two days. I'm assuming those who have to do community service as part of criminal punishment treat their hours in the same way: throw it into a small time frame and just get it over with it. There's a problem with funding, no doubt. And the people who work in and around the CIS pour in more hours than you or I know, and I've seen the number of press releases that get sent out during peak championship season. It is chaos. But there's no progress, and we need to find the reason that is. Leadership is a major factor in driving things forward, and the CIS hasn't been able to secure that leader. You're reading this, so you know the product is good. It's time for the conference to find someone who believes that and wants to bring it into modern times. If I have painted a grim scene, well, sorry. I really don't have much to be positive about. Interlock doesn't have a chance if the OUA isn't on board, and so far, it doesn't seem like they are even interested. I know they are saying one thing, but the actions suggest another. CIS football's opportunity for national relevancy looks like it will come and go without even getting a chance. And, sadly representative of the state of Canadian university sports, I'm not even surprised.
. . . bleak . . .